8 Liter Concentrator without Oxygen Sensor - SHIPS FREE! 8 Liter Concentrator with Oxygen Sensor - SHIPS FREE! Rental Program -- We want to make sure you get set up with the best concentrator for your needs, which is why we allow you to rent one before buying it, or just to take with you for a vacation. Generous Buy Back Program -- If your concentrator doesn't quite meet your needs, we will gladly make it right and help direct you to the perfect machine for you. Loaner Program -- In the event that anything happends to your concentrator you purchased from us, we will set you up with a loaner while yours is getting repaired. 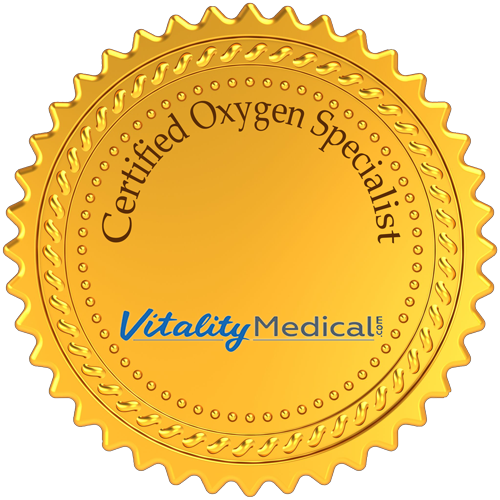 Vitality Medical is the leader in the field of oxygen concentrators for a reason: our expertise. At Vitality Medical, we understand how crucial and life-saving oxygen concentrators can be, and no one knows the ins and outs of portable and stationary concentrators quite like we do. That is because every one of our team members is internally certified to help our oxygen concentrator customers via a 50-question, 35-minute proctored exam taken every six months. These tests are not taken lightly. Each test must be passed with at least a 94% accuracy or better, and the questions are always being updated to keep up with the latest advances in oxygen concentrator technology. Specialists answer questions like, "how many hours of battery life does a concentrator need to have in order to be taken on an airplane" and know which sturdy, compact stationary oxygen concentrators can produce up to 8 liters per-minute, such as the Nuvo 8 Liter Oxygen Concentrator from Nidek. 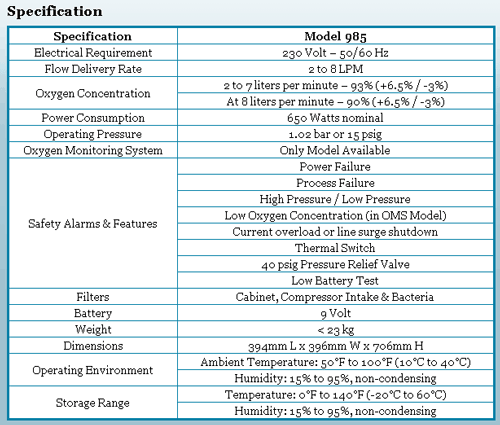 Standard Oxygen Concentration Status Indicator (With the 585 model). Patented Maintenance-Free Rotary Poppet Valve. Superior Grade Molecular Sieve Strips Nitrogen From Ambient Air. Reinforced Base Substructure and Recessed Casters to Guard Against Breakage. Spring-Mounted, High-Efficiency Thomas Nexus Compressor. A rapidly pulsing audible alarm goes off every time the machine is turned on to indicate power quality (a persisting alarm indicates a problem). A green LED light indicates power is applied and is ready to provide oxygen enriched air. The machine includes an alarm that sounds off intermittently if a power failure occurs. A visible and audible alarm is activated (blinking red light and sound) if there is a process fault. The alarm must sound loudly for five seconds to indicate good battery condition. It offers the user a power failure alarm test by simply unplugging the machine and turning it on to prompt the audio alarm. It gives an alarm if there the oxygen flow is blocked. 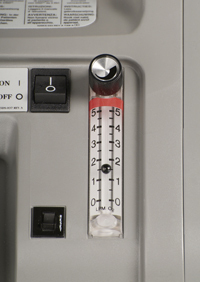 The compressor will automatically shut off if under excessive heat. Nidek Nuvo 8 Oxygen Concentrator Product: 580, 585. Oxygen Outlet Pressure: 17 psig. Operating Level Above Sea Level: 0-7,500 feet. Nidek Nuvo 8 Oxygen Concentrator Warranty: 3 years limited. 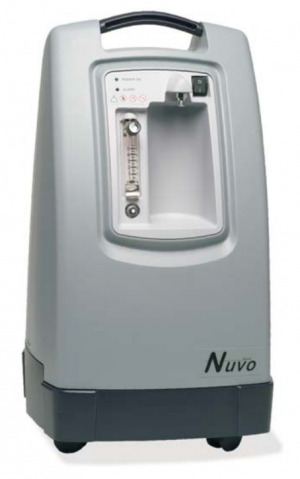 Nuvo 8 Oxygen Concentrator is the high output concentrator for those who need up to 8 liters of continuous flow oxygen for their respiratory therapy. 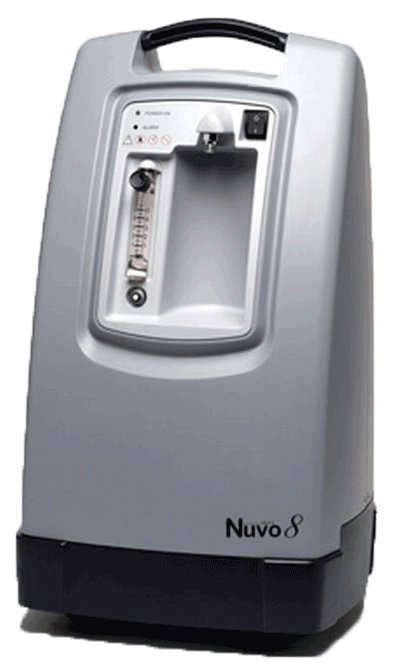 One of few popular machines that go above 5 liters, the Nuvo 8 is ideal for those who have intensive oxygen therapy needs. The machine is a medical grade oxygen concentrator manufactured in the United States by Nidek to meet the needs of patients who require concentrated oxygen at home. Nuvo 8 Home Oxygen Concentrator is surprisingly lightweight with a massive oxygen output. For an 8 liter compressor, it glides easily from room to room with its four smooth rolling caster wheels at the base. The slender tapered cabinet design on the Nuvo 8 allows it to be tucked out of the way when not in use. It comes with a sturdy handle fixed to the body of the machine to allow you to roll it to a desired location. 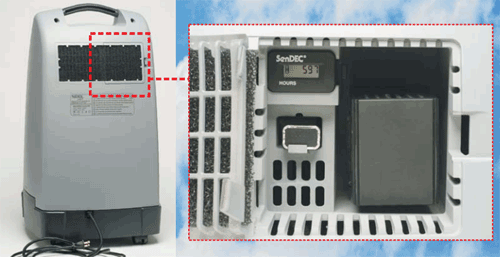 There is a back panel to access the filter, hour meter, and battery so the small amount of maintenance that is required can be done quickly -- this would include a simple cleaning of the cabinet filter. 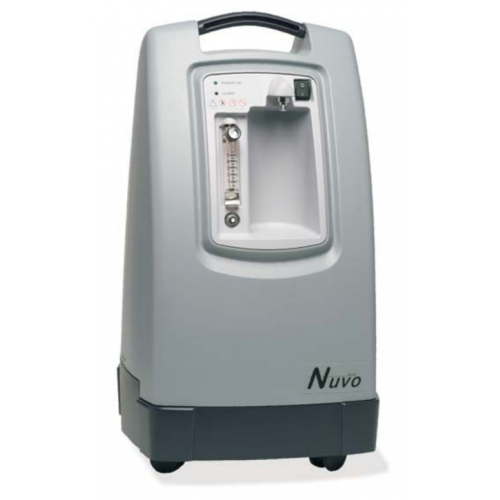 The Nidek Nuvo 8 Oxygen Concentrator operates at less than 48 dBA to provide quiet operation. 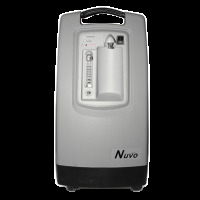 Nuvo 8 Brochure provides features and benefits for this 8 Liter Oxygen Concentrator. Nuvo 8 Mark 5 Concentrator Brochure describes the features of the Nidex Nuvo 8. Nuvo 8 Maintenance Guide provides information to keep your oxygen concentrator running in good shape. 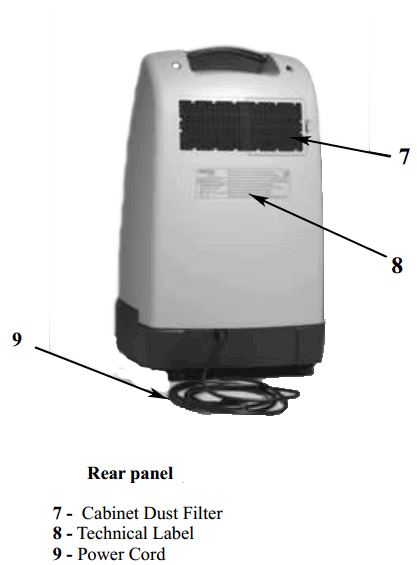 Nuvo 8 Mark 5 Oxygen Concentrator Users Guide has operating instructions and maintenance information. Nuvo 8 Patient Operating Guide contains operating and function information for your new concentrator. Nuvo 8 Mark 5 Maintenance Log offers a chart to record dates. Nuvo 8 Troubleshooting Guide offers a list of possible problems, cause and solutions. Nidek Nuvo 8 Service Guide has detailed technical information for repairing the Nuvo 8. Nuvo 8 Mark 5 Parts Diagram and Parts List provides detailed schematics for the Nuvo 8 along with part numbers. 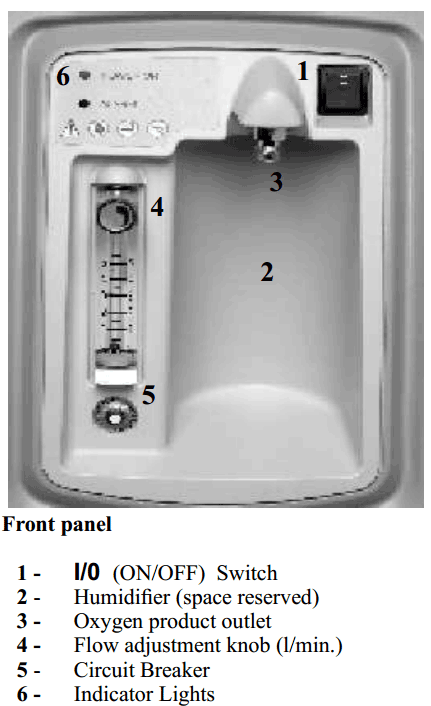 Nuvo 8 Preventive Maintenance guide to keep your concentrator running well. Nidek website page for the Nuvo 8 Liter Concentrator. Filters, Replacement Parts and Accessories for the Nuvo 8 Concentrator are available at Vitality Medical. Made in America sold me! I did not want a foreign made concentrator that would only last one year so I got this Nidek. Still working strong.